Kokoda Tour Operator Association Member (KTOA) Code. The KTOA is Australia and PNG’s most respected and professional association, specialising in trekking Kokoda. One member has been operating in PNG since the 1980s and our members have escorted more than 20,000 trekkers in total and run more than 220 expeditions a year safely across Kokoda. 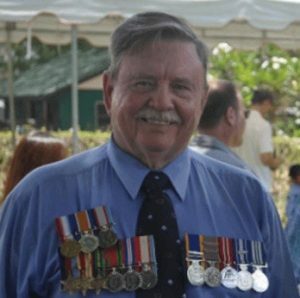 Our past KTOA President Frank Taylor is one of the original pioneers of the Kokoda Trail trekking industry. Frank has been leading treks since the 1980s. KTOA members will at all times conduct themselves in the highest ethical and moral manner and will not act in such a manner that the public’s trust and confidence in the Kokoda trekking industry, other Kokoda operators, stakeholders and Government organisations might reasonably be undermined. KTOA members will not bring the Kokoda trekking industry into disrepute. Employees, contractors, agents, and anyone else affiliated with the Kokoda Trekking Industry can be subject to a high degree of public scrutiny. KTOA members acknowledge that the individual manner in which we conduct ourselves can have a major bearing on the Kokoda trekking industries reputation and long-term viability. The KTOA members are the largest provider of trek fees to the Kokoda Track Authority. These fees are the lifeblood to sustain the ongoing work of the KTA. The KTOA is the largest employee of PNG Guides, Carriers and Porters and employ staff from the Villages and surrounding areas of the Kokoda Trail corridor. The KTOA, PNG Guides were born or raised along the Kokoda Track. We are proud to employ locals and provide income, training and a career to the local people of the Kokoda Trail. We also contribute the highest amount of campsite fees and site fees to assist in the upkeep of significant war sites. Members source fresh fruit and vegetables from local landowners. KTOA members were part of the foundation committee that assisted in the design and implementation of the trekking companies Code of Conduct. KTOA members have also been part of the Kokoda Track Maintenance Advisory Committee. All KTOA members are fully licensed and adhere to the Kokoda Track trekking code of conduct, administered and monitored by the Kokoda Track Authority (KTA) and the laws and regulations of both Australia and PNG, and hold a current KTA Licence. All members provide a comprehensive medical form that must be completed by a medical Doctor before you trek to make sure that you are in peak medical condition for Kokoda. KTOA members also carry a minimum $10 million in Public Liability insurance. All members have a comprehensive risk management plan and evacuation plan for casualties. All members have advanced or wilderness first aid trained guides and carry a comprehensive medical kit, satellite phone and have a 24 hour back to base team monitoring all treks on the track. The KTOA Australian and PNG guides have a great knowledge of the Track and its history. Our Australian Guides excel at remote first aid. Our PNG Guides are trained in first aid, food preparation, river crossing, and risk management and trekker safety. Our PNG Guides and senior PNG staff undertake a training process at the start of every trekking season. Our Porters and Carriers are also briefed and resourced with knowledge and equipment to allow them to work in a healthy environment. We provide group porter medical kits. We pay campsite fees for each of our porters. Each trek has a trained first aid porter who carries a porter medical kit. Each trek has a trained rope and river-crossing specialist. Each trek has trained cooks and camp staff that supply, prepare and cook our Porters hearty and healthy meals. We pay our Trek Guides and Porters above the industry average and above the recommended amount specified by the Kokoda Track Authority. The KTA approved weight for porters/carriers is 22.5kg Our Porters carry less than the specified weight recommended by the Kokoda Track authority and less than the International Porters code. We pay for Porter flights/transport to and from the Kokoda track or we pay them a walk back wage, which is a minimum K250. We supply camping equipment, sleeping mat and sleeping bag and uniform for our staff. Our porters and guides do not walk at night, as this is an unacceptable risk to our employees and trekkers. In addition to our own corporate values and behaviours, there are fundamental standards of conduct expected of anyone working in PNG and on the Kokoda Trail. Those who fail to do so, or who bring the Kokoda trekking industry into disrepute as a result of inappropriate behaviour, will be held accountable under this Code. The KTOA members desire to strive for excellence means we set a high standard for ourselves, and the people we work with. All KTOA members pledge themselves to conduct their business activities in a manner that promotes the ideal of integrity in travel and agree to act in accordance with the Principles of the KTOA Code. KTOA members will be factual and accurate when providing information in any form about their services and the services of any company they represent. They will not use deceptive practices. KTOA members will take every reasonable precaution to protect their clients against any fraudulent misrepresentation or unethical practices, which may arise in the travel industry. KTOA members operating tours and treks will take every reasonable action to ensure all components as stated in their brochure, web site or written confirmation is provided, or provides alternate services of equal or greater value or provide appropriate compensation. KTOA members will act fair and reasonably in their dealings with their clients, and provide complete details about terms and conditions of any travel service, including cancellation and service fee obligations, prior to accepting payment for a booking. Our PNG Guides and Carriers are briefed and resourced with knowledge and equipment to allow them to work in a healthy environment. The Kokoda Track Authority (KTA) approved maximum weight for Carriers is 22.5kgs. The maximum weight is less than the International Porter code and is strictlyenforced by our member companies. Indeed, most KTOA Carriers carry less than that, the majority between 8 – 20kgs. Generally, the weight of a Carrier’s pack at the commencement of their trek will be 20kgs or under. As the trek progresses, weights reduce due to the consumption of food. Pack weights are re distributed dailyresulting in a daily reduction of a minimum of 1 kg each day. Often, operators will have a food re-supply mid-trek. This will bring pack weights up again for one day, before reducing again on a daily basis. At no time are our Carrier’s pack weights over the maximum allowable, and are usually significantly lighter than the maximum. Our Carriers are not subjected to carrying heavy weights over the whole journey but have their packs lightened, redistributed and balanced so by the end of the trek their pack weights are down to 8-12kgs. We ensure our Carriers packs are appropriately packed and balanced. It is not appropriate for Carriers to carry items by hand as this can become a safety issue. We provide group Carrier medical kits. We pay camp site fees for each of our Carriers. Each trek has a trained first aid Carrier who carries a Carrier medical kit. Each trek has a professionally trained rope and river-crossing specialist. Each trek has trained cooks and camp staff that supply, prepare and cook our Carriers hearty and healthy meals. We pay our Trek Guides and Carriers well above the industry average and above the recommended amount specified by the Kokoda Track Authority. Our Carriers and Guides are on an upwards sliding pay scale from General Carrier on a minimum of 70 Kina per day through too our Senior Trek Masters who receive negotiated management pays. We promote from within giving each Carrier the possibility of advancing his career. We pay for Carrier flights/transport to and from the Kokoda track or we pay them a walk back wage plus supply them food or food money for the walk. Our Carriers and guides do not walk at night as this is an unacceptable risk to our employees and trekkers. We are also working with the local camp site owners to ensure suitable camp hut accommodation for our Carriers/carriers and guides to ensure they have clean, dry and smoke free accommodation.